Back on Wednesday Nov 28th, I took a walk through gate 40 up in Quabbin, MA. Quabbin is an artificially created reservoir that was constructed between 1930 and 1939 to service the water needs of Boston, which is many tens of miles away. This thing is HUGE! So huge, in fact, that its 412 billon gallons of water, 118 miles of shoreline, and 38 square miles of area have have created several artificial wildlife ecosystem. This includes nesting Bald Eagles! You may also glimpse moose, fox, bear, mountain lions (although the state vehemently denies they exist in the state), bobcat, and all other sorts of critter. On the flip side, Quabbin is also so huge that four towns were completely razed to the ground and disincorporated to make way for it. The majority of the lands of these towns are now underwater. However, several of the roads, cellar holes, and features of one town in particular, Dana, are still visitable. Dana is located by accessing Gate 40 of the Quabbin reservoir, off of route 32 (Hardwick Road) in Petersham, MA. If you are looking for an easy walk in the woods though peaceful wilderness, this is the place for you. You may also bike on the paved roads. The terrain is very easy and flat, with hardpack dirt and pavement being the primary routes. If you are the birding type, or the history buff, I suggest taking a visit to this place. It is open year round. The DCR even keeps abandoned town common upkept, mowed, and patrolled. It is nice to see this bit of history preserved. Quabbin itself offers many miles of trails for both biking and hiking, and it also has vehicle access to an excellent viewing tower. Visiting Quabbin at any time of year is recommended. In the Spring you have the wildlife returning and the flowers blooming. In the summer, fishing and general exploration are enjoyed. Fall brings New England colors and cooler temperatures more condusive to whole-day hikes, and winter brings the opportunity to see nature's cold grip on the land. Photography opporunities in the fall and winter abound for someone with a good eye. Being a public water supply, there are restrictions and the area is subject to being closed if security concerns arise. Visit the DCRs WEBPAGE for more information. If you are interested in viewing some pictures and learning about the history of the town I viewed, check out the page I just put up, "The Road Less Traveled, the Ghost Town of Dana"
Please note that the Dana write-up is a pictoral tour, and designed for users with high-speed connections to the internet. With highspeed it will take a few moments for the site to load. If you are using dial-up it will take quite a long time to load. December 2, 2007 - Winter Storm Warning? Well the TV is telling me "warning warning...bawoooga, bawooooga, snow on the way." Two to four inches due. That isn't anything to get excited about...however if there is a lot of icing, guess who will have the morning off tomorrow? I took advantage of my day off by heading up to Northampton by the Noho airport to take some pictures of the river. The sky was a cold, steel grey, and the fields were eerily silent less for the occasional bird. On a side note, if you are geocaching in the area and are looking for GC12XQF (Jack's Pulpit), I went out to that area on a scouting mission today. I was looking at ariel shots a few weeks ago of this particular wildlife sanctuary, noting that in the geocache's logs that people were wondering what the 'bridge pillars' were for near to this geocache. I did not find the geocache, but when I was looking at those ariel photos on Google Earth I noted that it really looked like an old rail-bed ran through here. As a matter of fact if you follow the lines, they lead right to the old rail-trail in Easthampton in one direction. 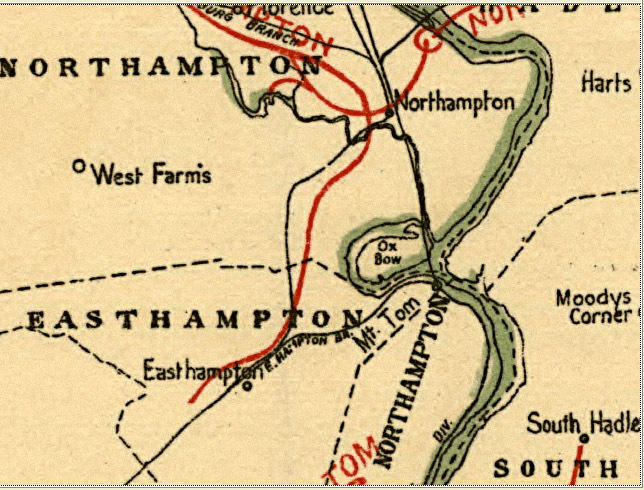 In the other direction it clearly goes to the old Union Station in Northampton. This area is lovely for a nice bike ride, or an easy stroll. You will probably encounter a vechicle or two, but most of this land is Massachusetts Audubon property so for the most part it is peaceful. Click HERE for their website. I discovered no positive proof that this was a rail line because everything was of course covered in snow. However, a map at the library of congress that I looked at coupled with the ariel shots pretty much has me convinced that this is an old railbed. I'd love to go out there with a metal detector and see if there are any old spikes left around. Here are some pics, click for the fill size. 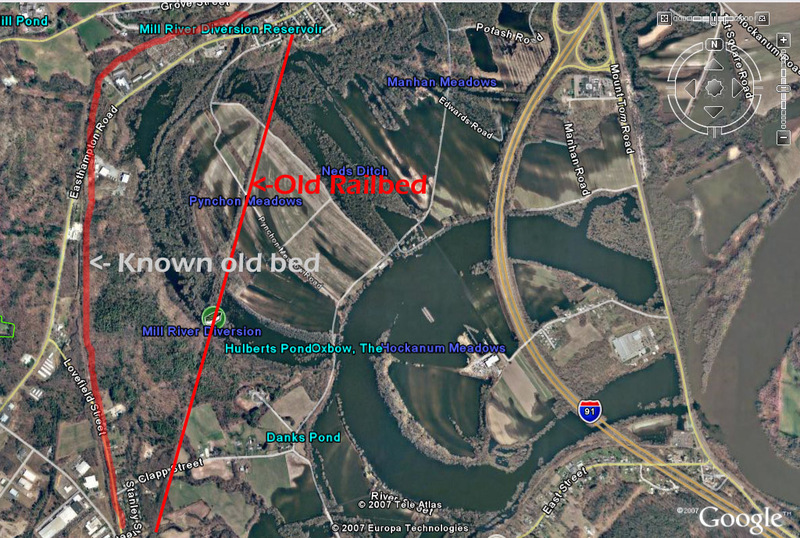 The "red" line on the railroad map pic is what I beleive this now defunt railroad bed to be. (in between the red lines on the google earth snapshot) I am using two reference points for this. Reference point one is another old railroad bed that I know for a fact is an old railroad, which loops out slightly to the left (west) of the bed in question. This is denoted as the 'black' line on the railroad map. Reference point two is simply the proximity to the oxbow. 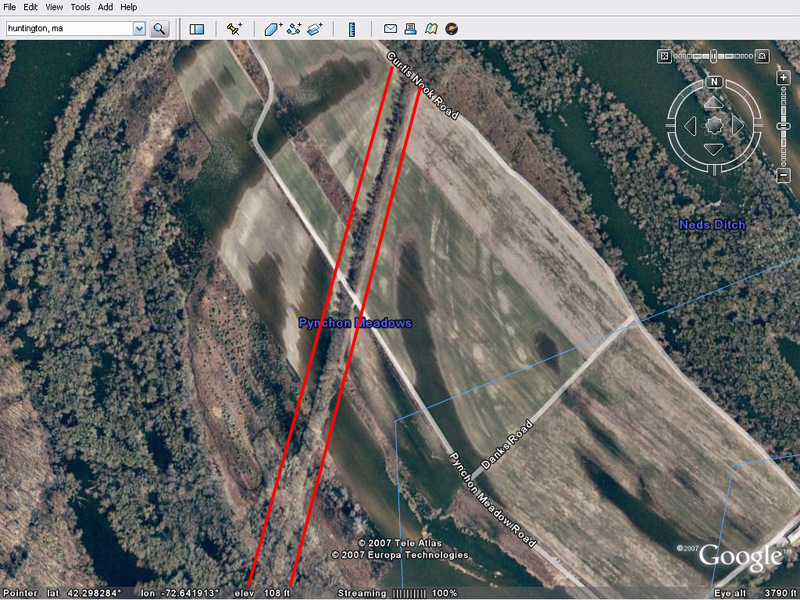 Also note how obvious the old oxbow is on the 'reference' google earth screenshot. Yes, the river used to take a different course that formed several oxbows along its length. Click thumbnail for full size imagery. Please note, some browsers rescale pic to fit in your browser window. Sometimes you have to click the pic after it opens again in order to get the full resolution. If you know for sure anything about the history of the area, click the 'contact me' under my pic in the upper left and shoot me an email! November 13, 2007 - Let The Snow Fly! Well well well. It seems as if lots of locations have gotten the jump on the ski season this year! Several other area mountains are planning to open/reopen this weekend. So I ordered up myself a Jetboil camp stove from Moosejaw.com I must say that I am very impressed with the folks over there at Moosejaw! They have some good prices, and at least at this time of the year, frequent 'specials' and sales. I picked up the jetboil for approximately $65, after taking advantage of a special "20% off any one item" sale. I would like to note, however, that the base price of the jetboil was still cheaper than the $89 that most sites and retail stores wanted. I was immediately emailed upon placing my order. This email contained a witty congradulations, thank you, contact information, and clickable tracking link all in one! The package shipped the next day and arrived on time when UPS said it would. It was very nice to see that the folks at Moosejaw recycle boxes. Of even greater suprise was to see that they marked out any personal identifying items that were printed on previous shipping labels. Apparently my box was also 'sealed with a kiss,' as a hand-signed sticker indicated to me. Overall I was extemely pleased with the overall experience. The website was easy to navigate, buyers write their own reviews, and attention to my order was prompt yet accurate. I would highly recommend these folks if you are purchasing any outdoorsy equipment!